Michael Dormer played in London in 1965 when he was working for the Flymo group launching an air cushioned lawn mower. He played for Southgate and was based at the delightful Walker ground. Mike was invited to join the Stragglers and played two or three games before being transferred to Australia. He very much enjoyed his games which were fiercely fought and felt that he was invited because, at the time, the Stragglers were short of a wicket keeper. Mike has felt very privileged to hear of the progress of the Stragglers over the decades. In 1994 Mike formed the Willows Cricket Club www.thewillows.co.nz The purpose of the club is to promote schoolboy cricket and he has received strong support from the Richard Hutton family based in Yorkshire and Roger Knight the former secretary of the MCC. The Willows has its own ground, beautifully presented in the countryside, just north of Christchurch, New Zealand. The club typically a hosts around thirty fixtures each season, of which, twenty three are against high school first elevens. Over the last eighteen years The Willows has sponsored two school leavers to Northumbria to play cricket and work for six months. They have been generously hosted by Sir Hugh Blackett at Matfen Hall. There have also been seven youth tours to Sri Lanka and the eighth is planned in April 2019 to Malaysia and Sri Lanka. The Willows Cricket Club also enjoys a close friendship with I Zingari Australia, a club Mike joined when he was transferred to Sydney over fifty years ago. Michael Dormer and The Willows wish to extend an invitation to any Stragglers and their friends to play at The Willows as we would be delighted to host them. 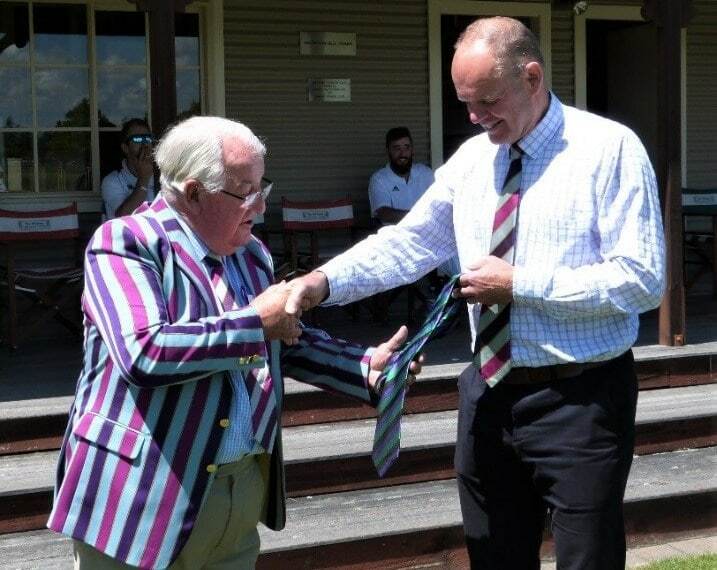 The writer, Andrew Nuttall (shown presenting a Stragglers of Asia tie to Mike at The Willows CC) toured with I Zingari Australia in July 2018 and played against the Stragglers at Shepperton Cricket Club. We very much look forward to returning your hospitality sometime.